On June 26, 2017, American Red Cross Minnesota Region board members sponsored a blood drive celebrating a century of service in Minnesota. The drive honored men and women in uniform who serve our communities. 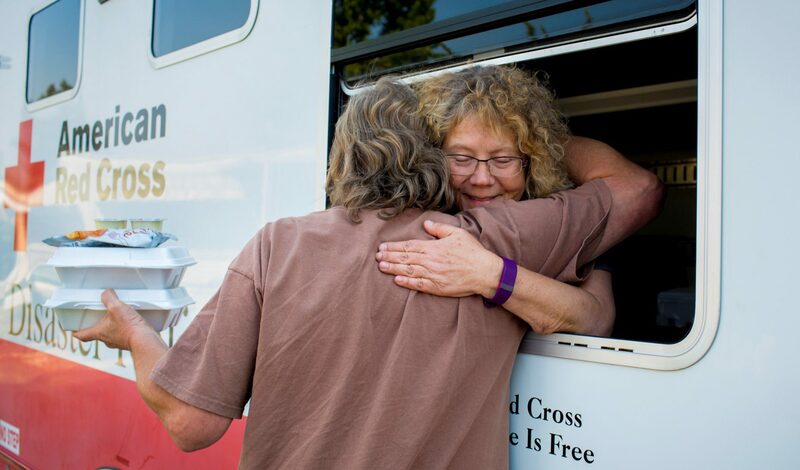 It came at a critical time: during the summer months when blood donations decline. 87 pints of blood were collected at this drive, helping the Red Cross continue supplying hospitals with blood so patients can receive treatment they need. Below, we share stories about some who helped make this lifesaving blood drive a success. Laura Antelman is an assistant at a rehab facility. She’s pictured here with Coco, who’s being trained as a service dog at PawPADs (Pawsitive Perspectives Assistance Dogs). While service dogs aren’t therapy dogs, they have the same gentle demeanor and help calm people who are afraid of giving blood. Coco did a wonderful job helping people relax, and she got along very well with Laura. Gene Olesen (pictured left) has donated more than 20 gallons of blood over the past 50 years. He’s been married to Nancy (also pictured), of 48 years. Nancy came with Gene to the drive to donate and to have a lunch date! Less than 7% of the world’s population has Type A negative blood, and Gene is one of them. He says his main reason for donating is to help cancer patients. And despite moving across the country he has continued to donate – from St. Paul to California, and from California to Wisconsin. Sophia Sexton (far left in photo with friends) is the daughter of Red Cross board member Amy Rolando. It was Sophia’s first blood donation, and she brought 16 of her friends with her. Thank you to Sophia for all the lives she helped save. Lisa Bardon, the regional accounts manager for the North Central Blood Services Region, shares a caring moment with her husband, Al Wivell (pictured left with Lisa). They both donated blood. A special thanks goes out to all board members who helped recruit blood donors or helped with the centennial drive. These board members truly demonstrated the Red Cross mission with their hard work. Pictured below, left to right: Amy Rolando, Phil Hansen, Minde Frederick, Jan Hallstrom, Lani Jordan, Joan Purrington, incoming board member Ole Hovde, and Dave Adriansen. The Red Cross is facing a critical blood shortage this summer and has issued an emergency call for eligible blood and platelet donors of all blood types to roll up a sleeve now to help save lives. Blood donations are being distributed to hospitals faster than donations are coming in, and more donations are needed now to replenish the supply. Bryan and wife Shauna were blood donors before the accident. And once they even went on a blood donation date! Although Bryan has some ongoing medical issues, he’s working full-time and looking forward to riding his bicycle again this spring and summer. Although unable to donate blood right now, hopes that he will be able to in the future. “I’m just a cheerleader right now, but I hope to be able to donate in the future,” he says. Bryan’s story is a testimony that blood on the shelves help save lives. Thanks to all people working to ensure that the Red Cross is able to support a stable blood supply for hospitals and patients we serve. To help ensure a sufficient supply for patients, make an appointment to give now at rcblood.org/2nqkmU8. Click here to learn about hosting an American Red Cross blood drive; or contact Mary Pucel, Donor Recruitment Director, at mary.pucel@redcross.org or 651-291-3366.